NEW YORK, NY—June 21, 2017—O’Melveny advised fuboTV, the leading sports-first streaming TV service in the US, on its US$55 million series C financing. This funding round brings the total investment raised to date by fuboTV to more than US$75 million. The O’Melveny team was led by partners Warren Lazarow and Brian Covotta, associate Snehal Desai, and senior paralegal Suzette Clay. NEW YORK(6/19/2017) - fuboTV (fubo.tv), the leading sports-first streaming TV service in the U.S., today announced it raised an additional $55 million (U.S. dollars). The Series C round was led by leading Europe and New York-based VC fund Northzone, which will take a board position at the company. Also participating in the round are 21st Century Fox and Sky – both previously part of fuboTV’s Series B round – and Scripps Networks Interactive. The total investment raised to date by fuboTV is now more than $75 million. Launched in January 2015 as a streaming soccer service, fuboTV has evolved into one of the top virtual MVPDs in the U.S., bringing subscribers access to dozens of sports, entertainment, and news channels. The company launched its expanded “Fubo Premier” entry-level bundle in April 2017 with a line-up of 55-plus channels, including 31 that feature sports content – more than any competitor’s similar package. This live streaming TV line-up features coverage of the most popular sports teams, leagues, and tournaments in the world, as well as both professional and collegiate local teams via regional sports networks (RSNs) from Fox Networks Group and NBCUniversal. 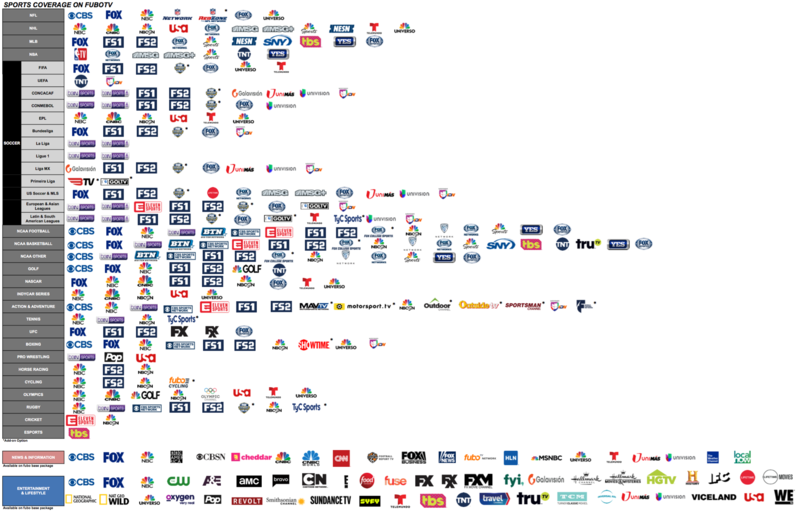 All channels available via Fubo Premier, as well as several add-on options, can be found at fubo.tv/welcome/channels; and a list of channels, broken down by sports carried, can be seen on this chart. With the closing of this fundraising round, Fubo plans to expand its basic line-up with new programming offerings; grow its engineering and product teams to continue to improve its state-of-the-art, back-end technology and build additional features focusing on its sports fan enthusiasts; and expand marketing efforts. Currently being offered at a discounted introductory rate of $34.99 per month, Fubo Premier is available with no long-term contract and for a free seven-day trial. In addition to streaming their favorite programming live, on demand or via DVR on fubo.tv, and through Fubo’s mobile and over-the-top (OTT) apps (see below for a full list of compatible devices), it was recently announced that subscribers can also use their Fubo credentials (name and password) to log directly into several popular channels’ websites and apps. This includes authenticated access to live and on demand programming – including additional content exclusive to these platforms – at no additional cost. LionTree Advisors served as financial advisor and placement agent for this round. fuboTV is a sports-first streaming TV service that brings subscribers over-the-top (OTT) access to a growing line-up of national channels and regional sports networks (RSNs) that hold rights to the most popular sports in the world. Officially launched in January 2015 as a streaming soccer service, fuboTV has evolved into one of the leading virtual MVPDs in the U.S., with its entry-level Fubo Premier bundle offering more than 55 channels, including 31 that carry sports, and bringing customers access to popular entertainment, news and information content that complements this core offering. It is available on desktop or mobile web via www.fubo.tv; on Amazon Fire TV and Fire TV Stick; Android and iOS devices; Apple TV; Chromecast; Kindle Fire; Roku; and through T-Mobile’s Binge On. The company has raised a total of $75.6 million in funding to date, including a $55 million Series C round that closed in June 2017, led by Northzone, and including 21st Century Fox, Sky and Scripps Networks Interactive. Investors also include DCM Ventures, i2bf, Luminari Capital, LionTree Partners, Univision Communications Inc., Edgar Bronfman, Jr. (former Chairman and CEO of Warner Music Group), Chris Silbermann (founding partner, ICM Partners) and former NBA Commissioner David Stern. Northzone is a European venture capital fund with offices in London, Stockholm, New York and Oslo. Founded in 1996, the firm partners with leading entrepreneurs to build global companies. To date, Northzone has raised 8 funds with a total of €1 billion under management, and has invested in over 120 companies. Northzone was an early investor in companies like Spotify, Lastminute.com, iZettle, Avito and Trustpilot. Visit Northzone’s website to find out more. Scripps Networks Interactive, Inc. (Nasdaq: SNI) is one of the leading developers of engaging lifestyle content in the home, food and travel categories for television, the Internet and emerging platforms. The company's lifestyle media portfolio includes leading TV and entertainment brands HGTV, Food Network, Travel Channel, DIY Network, Cooking Channel and Great American Country. Its digital division Scripps Lifestyle Studios creates compelling content for online, social and mobile platforms. International operations include TVN, Poland’s premier multi-platform media company; UKTV, an independent commercial joint venture with BBC Worldwide; Asian Food Channel, the first pan-regional TV food network in Asia; and lifestyle channel Fine Living Network. The company’s global networks and websites reach millions of consumers across North and South America, Asia-Pacific, Europe, the Middle East and Africa. Scripps Networks Interactive is headquartered in Knoxville, Tenn. For more information, please visit scrippsnetworksinteractive.com. 21st Century Fox is the world's premier portfolio of cable, broadcast, film, pay TV and satellite assets spanning six continents across the globe. Reaching more than 1.8 billion subscribers in approximately 50 local languages every day, 21st Century Fox is home to a global portfolio of cable and broadcasting networks and properties, including FOX, FX, FXX, FXM, FS1, Fox News Channel, Fox Business Network, FOX Sports, Fox Sports Network, National Geographic Channels, STAR India, 28 local television stations in the U.S. and more than 300 international channels; film studio Twentieth Century Fox Film; and television production studios Twentieth Century Fox Television and a 50% ownership interest in Endemol Shine Group. The Company also holds a 39.1% ownership interest in Sky, Europe's leading entertainment company, which serves 22 million customers across five countries. For more information about 21st Century Fox, please visit https://www.21cf.com. Sky is Europe's leading entertainment company, serving 22 million customers across five countries: UK, Ireland, Germany, Austria and Italy. We offer the best and broadest range of content, deliver market-leading customer service and use innovative new technology to give customers a better TV experience, whenever and wherever they choose. Sky has annual revenues of £12 billion and is Europe's leading investor in television content with a combined programming budget of £5.2 billion. The group employs 30,000 people and is listed on the London Stock Exchange (SKY). All figures referenced are as at 30 June 2016 and are approximations.